Desktop Right Click was never so easy to manage. 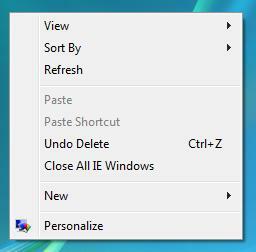 Adding new menu items / deleting added menu items to Windows Explorer's Right Click Menu is just a few clicks away. Your favourite menu option in Desktop Right Click Menu can be really helpful to you. Download this tool and manage your desktop right click menu on Windows Vista and Windows 7 with ease. 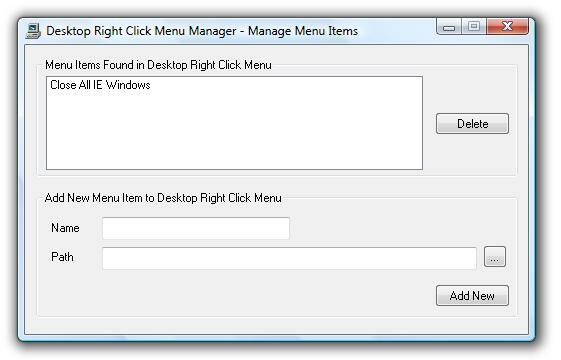 Once you are done with adding or deleting menu items to right click of desktop, you can close the Right Click Menu Manager Software. You can even add Menu options to Windows XP Right Click Menu without admin rights. The new options added will be displayed as displayed in the screenshot to the right and would not appear at the top as added by the Desktop Right Click Manager. This option will also work on Windows Vista and Windows 7 as well and would not require admin rights everytime you run the application and add or delete options to the right click menu of Windows XP, Vista etc. However the new options added with this option would be displayed only for the signed on user of the Windows computer. Extra Menu options and many other Display related control features are provided by the Dual Monitor Software which can be used on a single or multi monitor Windows computer. Please do have a look at the given below small tutorials for using the Desktop Right Click Menu Manager. The Steps for adding or deleting menu items to the right click of Windows Desktop are given below. Add New Menu Item(s) to Desktop Right Click Menu easily. Easily Delete New Menu(s) added to Desktop Right Click Menu. Download Free Trial of Desktop Right Click Menu Manager Now. 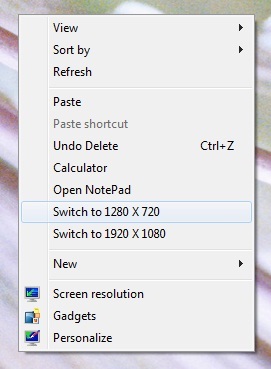 Given below screenshot displays Desktop Right Click Menu Manager's main window with a menu item added to the desktop right click. The Menu option added to the Desktop Right Click Menu is labelled as Close All IE Window which when clicked will close all open Internet Explorer Windows. Desktop Right Click Menu Manager is an integral part of our another software Turn Off Monitor, and costs same as the cost of Desktop Right Click Menu Manager (i.e. $5.00). Register and get Turn Off Monitor and Desktop Right Click Menu Manager Software Utilities. Once Payment is confirmed, we will send you registration details, by email to your paypal email id. Alarm Clock, World Time, and more free to try softwares.